I love ice cream. I'd like to think that i'm an ice cream aficionado. I know what tastes good, what good ice cream texture should be like, and what is needed to satisfy an ice cream lover's cravings. Luckily, there is a place like Churned Creamery that falls in the really good-amazing category. 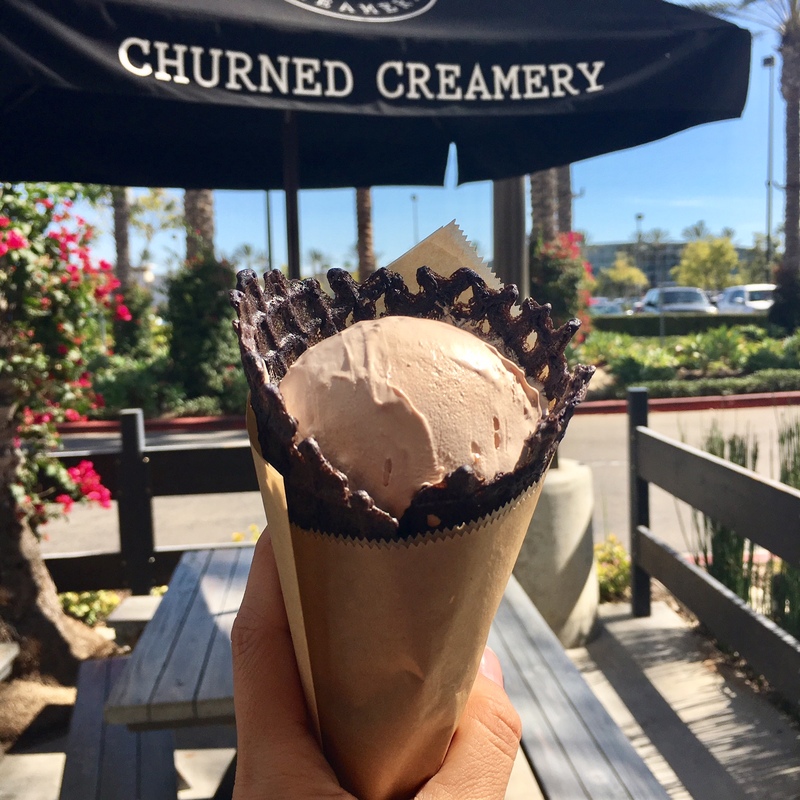 Churned Creamery is located in Tustin in what seems to be similar to the Anaheim Packing District. The kiosk is small and churns traditional flavors to interesting ones, hence the name. Everything is fresh, including one of their signature desserts: the croissant ice cream sandwich. SINGLE ICE CREAM WITH TAHITIAN CONE ($4.00 + $1.00 FOR CONE): Nutella. This was absolutely delicious. The ice cream was creamy and not too dense. The nutella flavor was very prominent in the ice cream, which is hard to find. The cone is delicious with a nice and subtle vanilla flavor. It's worth spending the extra $1.00 for it! MY FAVORITE DISH. CROCREAM ($5.00). This is so freakin good! 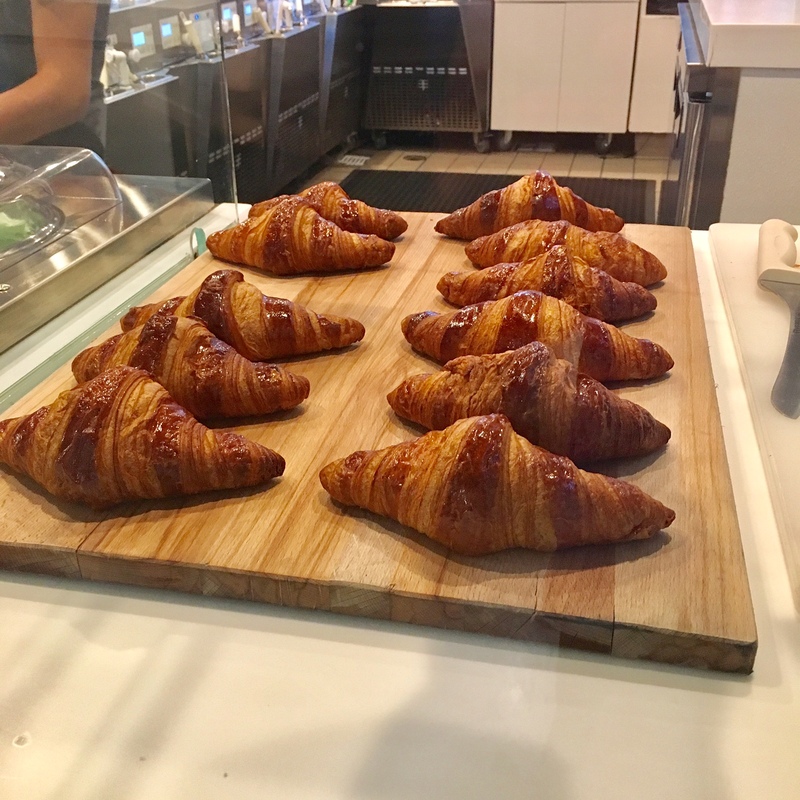 Who doesn't like a croissant that is super flaky and buttery that is filled with ice cream of your choice? Seriously, what a great concoction! We got chocolate and it went perfectly with the croissant. Overall, this place is pretty darn good. I love the fact that you can see the ice cream being churned right in front of you. The ice cream is super fresh and creamy, without being overly dense and heavy. It's something I definitely appreciate. An abundance of flavors are available at the kiosk and outdoor as well as indoor seating is available. If I'm just chillin' around Tustin, I'd definitely hit up this place.